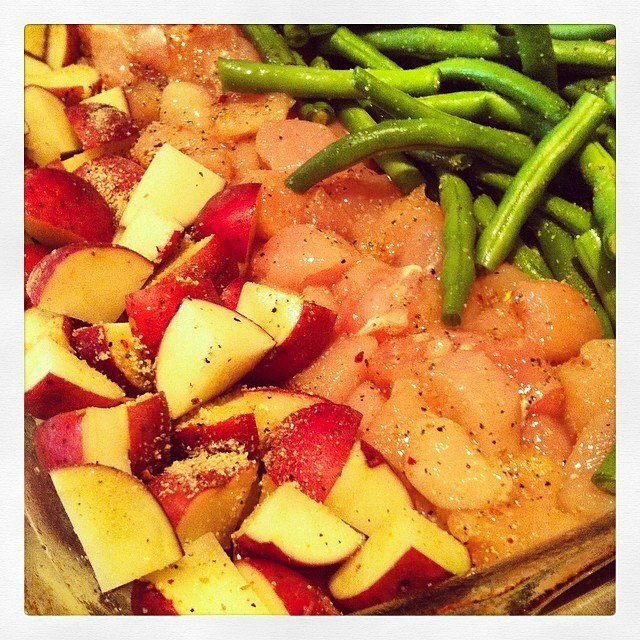 I came across this recipe on pintrest which took me to Cheap Recipe Blog. Haley, the creator, has an amazing site and my stomach started to growl as soon as I started browsing. Please take my advice and check out her recipes because, my gosh, they ALL look amazing (I should note that I make no profit on this blog and Haley did not ask me to say any of this. It is my sincerest opinion). Tomato soup and grilled cheese is total comfort food where I am from, and seriously I don’t think there could be a better pair. This soup is not your ordinary Campbell’s condensed tomato soup. Now that I know how easy this is to make I’ll never go back. In a large saucepan, sauté onions in olive oil until the begin to become translucent. Add garlic and cook for an additional 30 seconds. Crush the whole tomatoes and add them (with the left over juice) to the pan, after the tomato mixture warms, add baking soda and stir well. It will froth but do not worry that just means it is doing it’s job. Add chicken broth, half-and-half, and sugar, and mix well. Add spices and simmer for 15 minutes. While soup is settling cook up a grilled cheese and slice into bite sized squares. 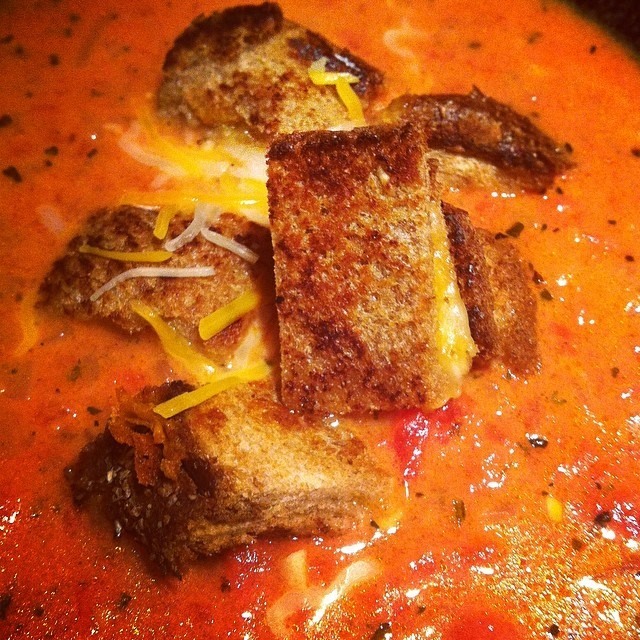 Use half of the grilled cheese croutons per bowl of soup. Perry occasionally invites his band mates and their wives over for dinner. Since they put up with him and his crazy antics during the 80s I feel like I really owe them 🙂 Because of my deep appreciation for them all I try to make dinner really special. We don’t usually make sweets unless we have guests because frankly I’m terrible at baking. 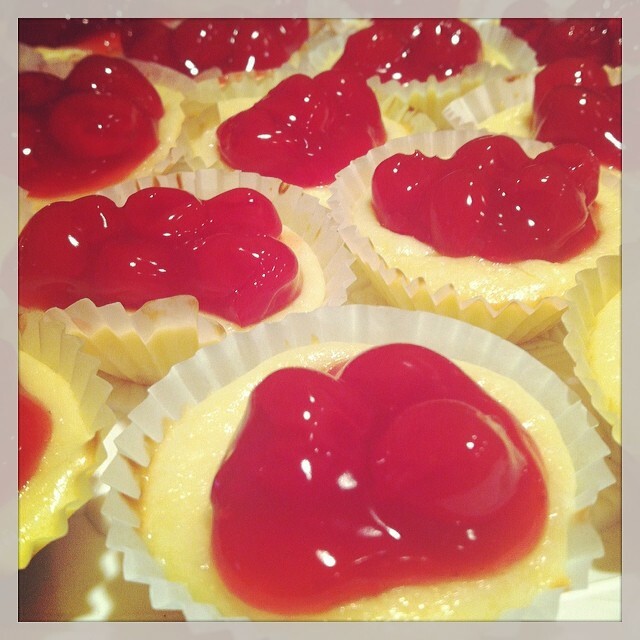 These mini cheesecakes were good because they required minimal work on my part and were delicious. Line mini muffin tins with mini paper liners. If you do not have a mini muffin tin just set the paper liners on a baking sheet. Put a vanilla wafer at the bottom of each liner. In a mixing bowl, beat cream cheese, sugar, eggs and vanilla until light and fluffy. *It helps to soften the cream cheese for a few seconds in the microwave. Fill each mini paper with mixture almost to the top. If not using a mini muffin tin do this very carefully. Top with a few cherries and filling.